"CARRY ON" SIZE BACKPACK, "NON CAMO" CITY EDITION, "RAMONES" iPad bag, "RUSSIAN DOLL" 3 SIZES BACKPACK SET, AIRLINE STYLE SHOULDER BAGS, CLIMATE, ONE-OFF "MESSENGER BAG" COLLECTION, PV1 JEANS, SPECIAL ORDER FOR "DUKE"
While camouflage for the bush and the desert is all well and good, if you want to stand out in the city then it’s a different story. Here are a few ideas i came up with. Small Medium and Large are the three most common sizes in most applications. This bag comes in those sizes, the small fits into the medium and the medium fits into the large, which is also the maximum carry on luggage size. This style is made to be a lite, basic backpack for everyday use. Bike riding has been a passion of mine ever since I learned how to do it. This range of messenger bags was inspired by “The Wheel”, Roads and Velodromes, Appliqué is used to create this look. This Appliqué inspired range of shoulder bags proves the diversity within the art. The subject matter is no barrier to creating a personalised bag. As the “Ramones” are one of my favourite bands, i thought i’d pay tribute to them with this little number using Appliqué. This bag can be fully customised with choice of colours, fabrics and design features. Making the most of your carry on luggage allowance can be the key to a hassle free luggage experience. This backpack will help you to do just that. This backpack can be fully customised with choice of colours, fabrics and design features. Duke is a happy little camper now that his mum commissioned me to make him the ultimate gear bag for his size. 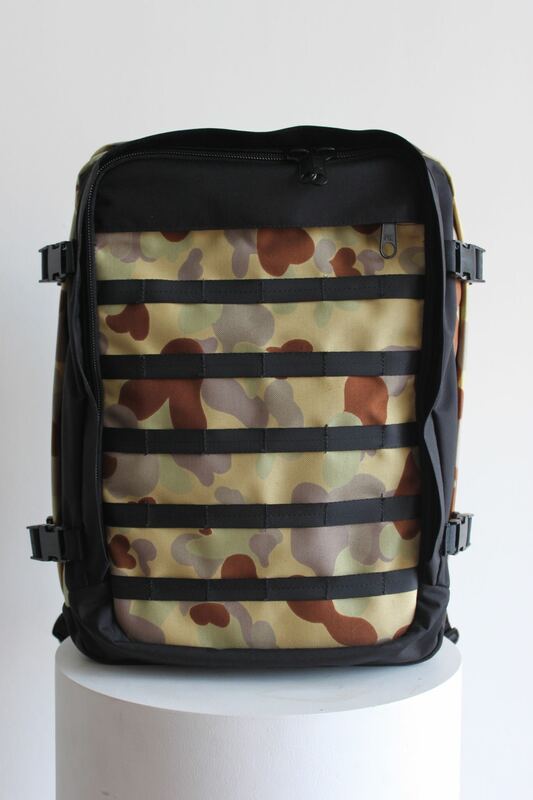 Duke also has a PV1 Daycare backpack and has also upgraded to a PV1 School bag. This backpack can be fully customised with choice of colours, fabrics and design features. A range of custom made jeans was made for a local “50’s” style fashion store. Tailor made jeans are also available for personal customers featuring custom stitching and sizing. In 1994 I completed a course in Knitwear manufacturing. Learning how to design Knitwear and program Knitting machines for manufacturing, opened my eyes to the possibilities for making one off custom made garments. I sold my second Jumper to a friend and my first knitted dress to a fellow classmate before completing the course, this gave me the confidence to take Knitwear seriously and start my own label “CLIMATE”. I purchased an industrial hand machine and started supplying one off Jumpers and T-shirts to “FELINE” a clothing store in Auckland city, New Zealand. Demand was high and I was also taking orders from my studio. As the “climate” is such a big factor in deciding what we are going to wear, I thought it was a fitting word to use as my label. PVC was making a comeback and I introduced it into my range mixing it with knitwear to create something unique. Sydney, Australia looked like a nice place to expand to so in 1996 I moved there with a couple of friends to open a store “DISH” in Newtown. Also supplying to “INDENIAL”, “PRETTY DOG” “FASHION DESIGNERS EMPORIUM” and various other stores and markets. In 1999 I took my trade to London, England and tried my hand at various markets including “Camden Markets”.